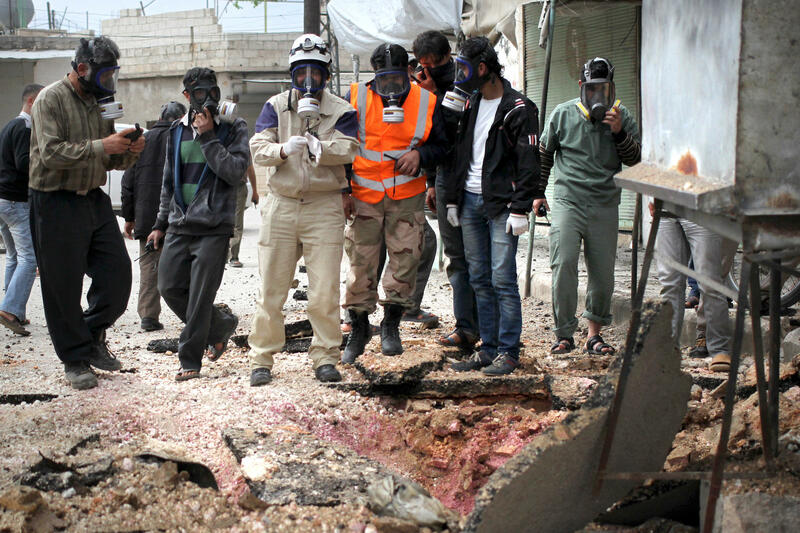 Civil defense workers wear gas masks near damaged ground in a village near the Syrian city of Idlib in May. Activists said there had been a chlorine attack. 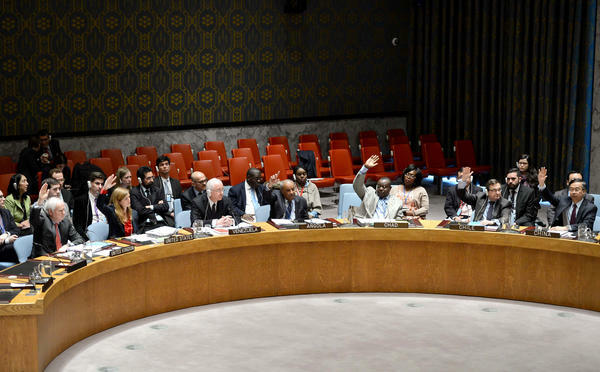 Diplomats at the U.N. Security Council teared up in March as they watched a video of an apparent chlorine gas attack in Syria. The video showed doctors trying to revive three children as they choked to death. The U.N. condemned the use of chlorine as a weapon, and the U.S. has pushed for stronger action, but the attacks continue. NPR's Deborah Amos reports from southern Turkey on the effort to hold the attackers accountable. DEBORAH AMOS, BYLINE: Syrian Hazem Halabi has become an expert on chlorine as a weapon of war. His first investigation was in April 2014 in the village of Kafr Zeta. UNIDENTIFIED PEOPLE #1: (Foreign language spoken). AMOS: This is an activist's video from the village after residents say they awoke to the sound of helicopters and the strong smell of bleach. Doctors struggled to treat choking victims. Hazem Halabi arrived a day later. HAZEM HALABI: I went to the location of the attacks and I was in the hospital. AMOS: You risked your life to bring samples out of Syria. HALABI: Yes. Yes, that's what happened. AMOS: A medical student before the war, Halabi is now a chlorine investigator. He's part of a team of doctors with the Syrian American Medical Society, a U.S.-based charity that runs more than 90 medical facilities on serious front lines. Halabi delivered his first samples more than a year ago to the U.S. and the British embassies in Turkey. Did Western embassies accept the documentation? HALABI: Yes. I brought blood samples, urine samples and some remains of the canisters. AMOS: The doctor's network has compiled a detailed dossier on dozens of chlorine attacks it attributes to the regime. Eyewitnesses say chlorine is dropped from helicopters, and the regime is the only combatant that has them. The physicians testified at the U.N. and again on Capitol Hill, yet the attacks continue. Now Halabi wonders if the risk to investigate was worth it. HALABI: I don't have the same belief that something will happen. AMOS: Because nobody did anything about it. HALABI: Yes. Unfortunately, nobody react. AMOS: At a family dinner, in one his rare visits to southern Turkey, I meet a Syrian defector, former Brigadier General Zaher al Saker. He says he's investigated more than 90 chlorine attacks, six new ones in the past few months. He was an officer in the Syrian army's chemical division, and he quit when he was ordered to use chemicals against civilians, he says. ZAHER AL SAKER: (Through interpreter) I realized that this regime is only going to use more and more chemical weapons. And that's when I made my decision to defect. AMOS: The Assad regime has consistently denied using any chemical weapons, including chlorine, but the evidence has steadily mounted since the U.S. and Russia worked together to pass a U.N. resolution to dismantle Syria's chemical arsenal. Chlorine wasn't included because it has industrial uses, including purifying water. REX BRYNEN: There's no doubt that the Syrians are using industrial chemicals - chlorine particularly - in barrel bombs. I think that the open-source evidence is overwhelming. And I think I can say with some confidence that Western governments are absolutely convinced that the Syrians are doing this. AMOS: That's Rex Brynen. He's a Middle East specialist at McGill University. Chlorine attacks have sent hundreds to hospitals in Syria, but it's a psychological tactic, he says, spreading more panic and fear than death. Many more Syrians have died from conventional weapons. BRYNEN: The effects of a chlorine barrel bomb are awful, but they are not necessarily any more awful than a barrel bomb filled with conventional explosives. Chlorine is not particularly effective in a single detonation. Chlorine versus other kinds of barrel bombs just simply isn't a big enough issue to move Western policy. UNIDENTIFIED PEOPLE #2: (Foreign language spoken). AMOS: But this video shows the human toll, especially for the very young and the elderly. In the aftermath of an alleged attack this year, chaotic scenes of choking and panic. Human rights groups have long complained that the architects of the earlier deal that dismantled Syria's chemical arsenal have done nothing to stop chlorine attacks. Now the U.S. and Russia are consulting again. A proposed U.N. resolution would mandate an investigation to assign blame for using chlorine as a weapon and sanction the culprits. It remains unclear whether it will come to a vote. Deborah Amos, NPR News. Transcript provided by NPR, Copyright NPR.